The S&P 500 (U.S. stock market) is still in a bull market. This 11.8% “small correction” won’t turn into a “significant correction”. Hence the stock market’s medium term downside is limited. The Medium-Long Term Model predicts “significant corrections” based on a set of conditions. When none of those conditions are met (i.e. right now), it is highly unlikely for a “small correction” to turn into a “significant correction”. This means that the stock market will eventually make a new high given enough time. Read this post if you haven’t already: Why isn’t the stock market going up despite very strong fundamentals. Medium term bullish. The stock market will make a new high over the next few months. Short term bearish. The road to a new high will be choppy with pullbacks along the way. The economy and stock market move in the same direction over the long term. This means that leading economic indicators are also leading indicators for the stock market. This week’s analysis demonstrates that economic growth is still solid in the U.S.. There are no signs of significant deterioration. For starters, the yield curve has not flattened in 2018. This buys the bull market some time because the yield curve typically inverts before an equities bear market and recession begin. Initial Claims and Continuing Claims (leading indicators) are still trending lower. This supports the case that the equities bull market isn’t over. Housing Starts (a leading indicator) and Industrial Production (sometimes a leading indicator) continue to trend higher. 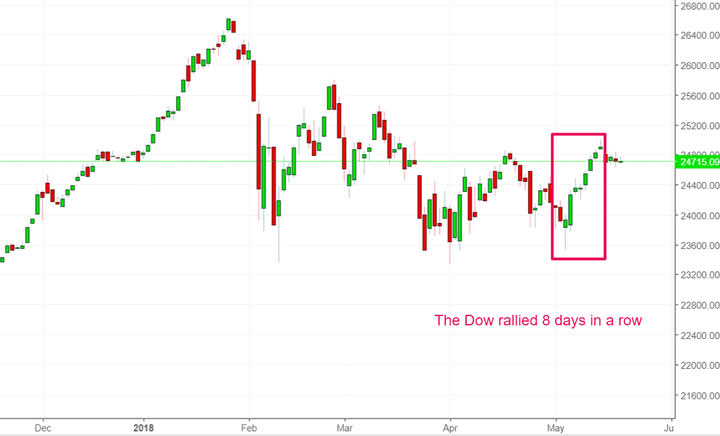 With the stock market (S&P 500) having ALREADY fallen 11.8% from January-February 2018, the stock market’s medium term downside is LIMITED if it doesn’t make a “significant correction”. The U.S. stock market faces several short term problems here. These are mainly technical. And of course, there’s the standard technical analysis that you’ve probably already seen. 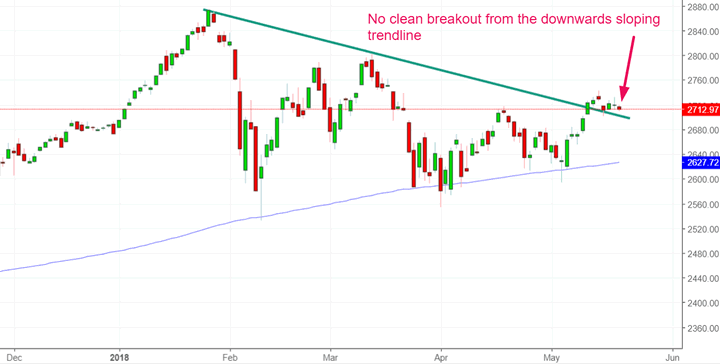 The S&P 500 is still stuck near its downwards sloping trendline without a clean breakout. And of course the S&P 500 is facing resistance on its 61.8% retracement. Small cap stocks (Russell 2000 Index) are leading the stock market higher. 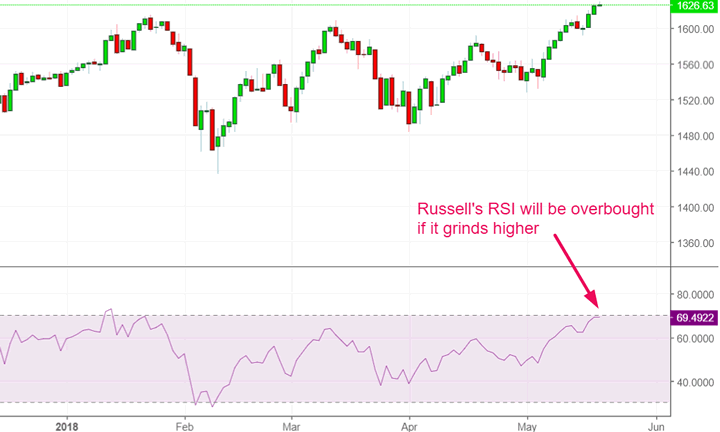 Russell’s daily RSI is getting a little high (this is not a meaningful concern right now, but will be if its RSI gets even higher). And one more thing. Everyone is freaking out about interest rates. Everyone’s talking about how a “breakout” in interest rates will kill the stock market and economy. This argument is wrong on multiple levels. Rising long term interest rates (e.g. 10 year yield) usually prevent the yield curve from flattening. The yield curve usually flattens when the long term yields fail to rise significantly. Hence, I believe that while the yield curve will continue to flatten over the next year, the increase in 10 year Treasury yields will be limited. These charts demonstrate that the 10 year yield only went up a little bit despite multiple Fed rate hikes from mid-2004 to mid-2006. Lastly, I’ve seen countless arguments stating “it’s all over when the 10 year Treasury yield reaches 3.25%”. I disagree. A “breakout” in yields doesn’t mean anything. 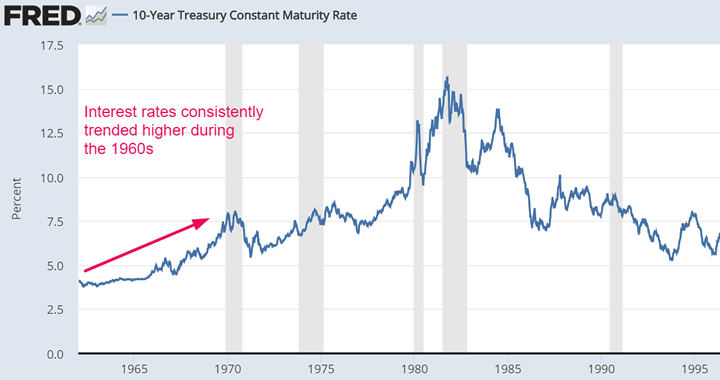 Yields consistently went higher during the 1960s, but there was no bear market in stocks until the end of the 1960s (after interest rates had gone up for more than half a decade). I agree with Michael Santoli from CNBC. Long term trendlines aren’t as useful as short term trendlines. Fundamentals determine the long term. Technicals are more useful for the short term. As I’ve said repeatedly here on the blog, the medium-long term is more important than the short term. Short term predictions are notoriously difficult, whereas medium-long term predictions are much easier to make. A medium term trend that’s powerful enough can easily overpower the market’s short term bullish/bearish bias. That’s why I stick to the medium-long term.